An Eco tour of 9 days, exploring six eco friendly districts and 7 tourist destinations. A journey covering, all kind of geographical diversities like beach, hill, forest, backwaters etc...is the best option for a holiday trip. The destination in this trip is the must seen destinations of Kerala. A lot of fun, too much of excitement and tones of entertainment will be the breath- taking effect of this expedition. So don’t miss this voyage from commercial capital to the state capital. Breakfast at Hotel.Munnar is the ideal spot for you, its magical, the weather is so perfect that you wish you could stay here throughout the year and it doesn’t hurt that you could wake up to the heart-tugging sight of the emerald carpeted tea estates all around you. Your Journey begins to Thekkady /Periyar /Kumily India’s largest wildlife sanctuary and it is a dream destination for any tourist visiting Kerala. Being a spice plantation tea, cardamom, pepper and coffee are grown abound in the areas adjoining the Tiger Reserve. There are a few watch towers inside the Reserve which are excellent for viewing the abundant wildlife. You can make reservations at the Forest Information Centre here. The Periyar sanctuary is a testimony to nature's splendour and human innovation. The high ranges of the Ghats are cloaked in dense evergreen, deciduous forests and grasslands. Along with elephant rides, cruises on the lake along with treks to the ruined Mangaladevi temple located in the heart of the forest, this sanctuary also offers a unique opportunity to watch and photograph wild elephants in their natural habitat, and that too in close and perfectly safe quarters. Your Journey Begins to Kumarakom Ecotourism spots.The beautiful village of Kumarakom is actually a tiny cluster of little islands on the Vembanad Lake. The place, which constitutes a part of the Kuttanad region, has a bird sanctuary spread across 14 acres. The sanctuary is a favourite haunt of migratory birds and is an ornithologist’s paradise. You can see Egrets, darters, herons, teals, waterfowls, cuckoo, wild duck and other migratory birds like the Siberian Stork which is fascination for people who visit the place. 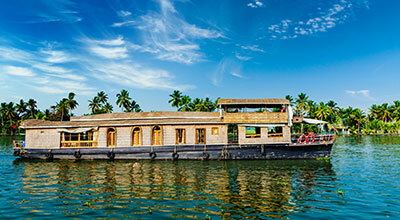 An enchanting backwater destination, Kumarakom offers its visitors varied leisure. Options. Boating like row boating, peddle boating, canoeing through narrow canals and fishing facilities are available. With the lush green background of coconut palms, the peaceful and sprawling backwaters, the Venice of the East is a great place to relax and enjoy a serene journey on a houseboat. Washed by the splendid silvery waves of the Arabian Sea, Alleppey is a destination that will welcome you for a houseboat ride of a lifetime. After boarding the houseboat by around 12 noon, you certainly need to be prepared for a thrilling ride through the spectacular backwaters of the state. As you cruise through the serene backwaters, you can enjoy the splendid scenery around you like the beautiful villages, paddy fields, the small churches and temples and the sight of the local people bustling about their daily activities. Your crew would have cooked sumptuous meals for you on board the houseboat and you would have an overnight stay on board the Houseboat. Shankumugham Beach or the beautiful two storied Kuthiramalika or the Horse Palace which houses numerous artifacts from bygone eras. You could also check out the Trivandrum Zoo and of course a day trip to Kanyakumari could offer you a chance to visit the Padmanabhapuram Palace, the seat of the erstwhile Travencore Royal Family and also visit the Kanyakumari beach(at an extra cost) to check out the splendid sunset which would be a bonus of your trip. This would be the last day of your truly wonderful journey through some of the best destinations of Kerala. Enjoy a splendid breakfast at your hotel and after checkout it’s time to drive towards Trivandrum for the onward journey. Of course, if time permits, then it would be a great way to say good bye to the place with a shopping trip in the city and when you’re done, drop back at the Airport or the Railway station for your journey back home after saying a last minute goodbye to God’s Own Country which would have given you plenty of memories for you to last a lifetime. One of the best hotels/ resorts in Munnar situated on the cliff edge providing cottages and accommodation services that make one feel at home. 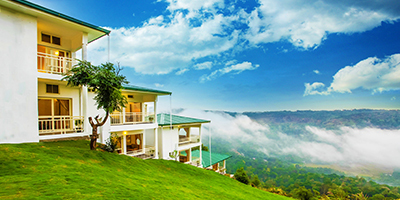 Along with the excellent views of nature through the windows and balconies, the stay here becomes a memorable one.